Katum was pretty remote--about 4 miles from Cambodia. 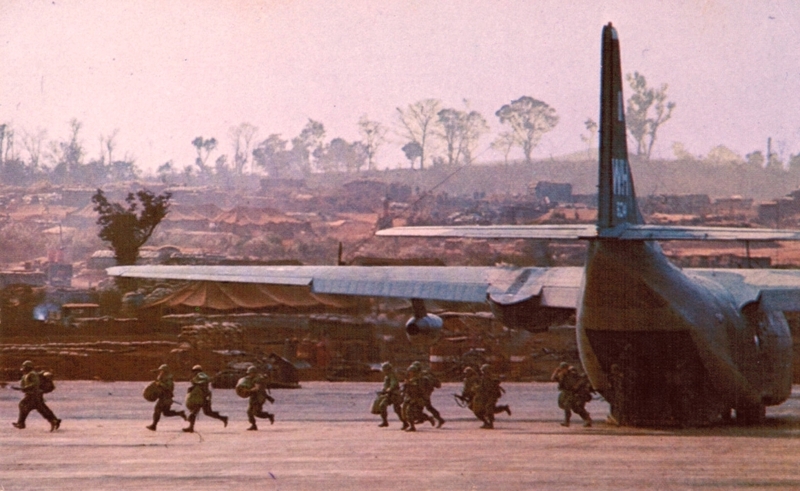 The VC operated freely back and forth across the border bringing weapons large and small to shoot at big targets like C-130's. 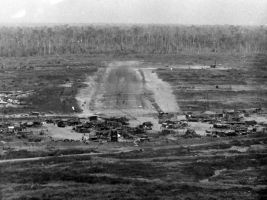 To make the VC easier to spot, the USAF defoliated the nearby jungle with Agent Orange--note the dead trees just beyond the runway. Katum was known as a hot spot for hostile fire. A couple of years earlier the VC hit a C-130 on departure there, and they crash landed at nearby Tay Ninh. Pat Hatch's story is hair-raising. Katum's runway was shorter than most--3000' of red dirt treated with Peneprime to keep the dust down. The soil there is called laterite and it is red because of the high concentration of iron. Army helicopters operating out of there needed fuel, and it was too hazardous to send tank trucks through "Indian Country", so we brought it to them. These flights were called "bladder birds". Sometimes we brought the fuel in 2' diameter round bladders called "elephant balls", which could be rolled if necessary. But usually we carried the fuel in two 18' lozenge-shaped bladders, and pumped the fuel out to trucks at the destination. The airplane's landing weight determined the length of its landing roll, which was quite limited at small fields like Katum. Based on the field length we calculated our maximum rollout, and from that we determined how many tons of fuel we could bring in. "Normal" short field landing criteria are different from "combat essential" landing criteria. If your mission was high priority (combat essential), thinner safety margins were acceptable. 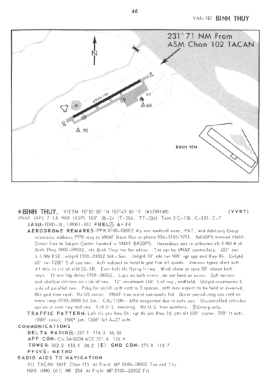 Max gross weight for normal short field landings was calculated assuming 2 props in reverse and 2 in ground idle. 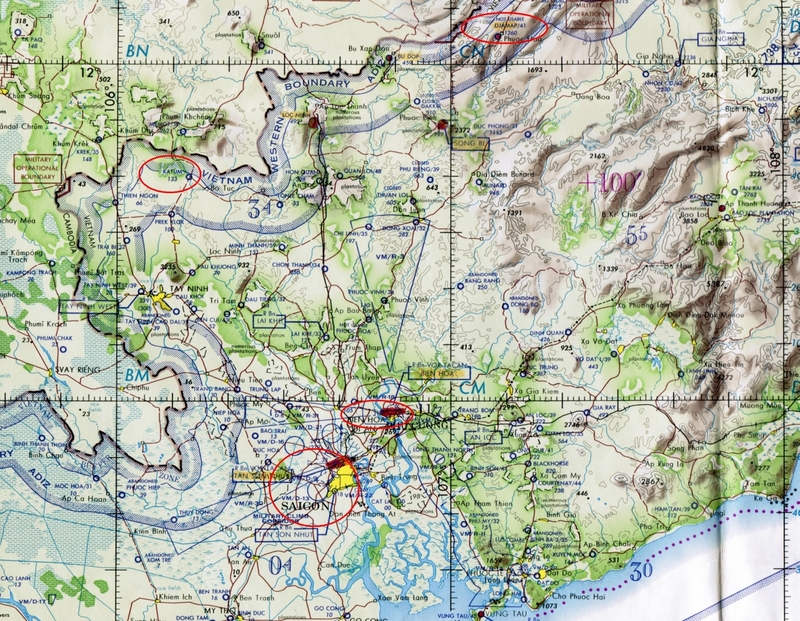 For combat essential missions we calculated the landing rollout assuming all 4 in reverse. 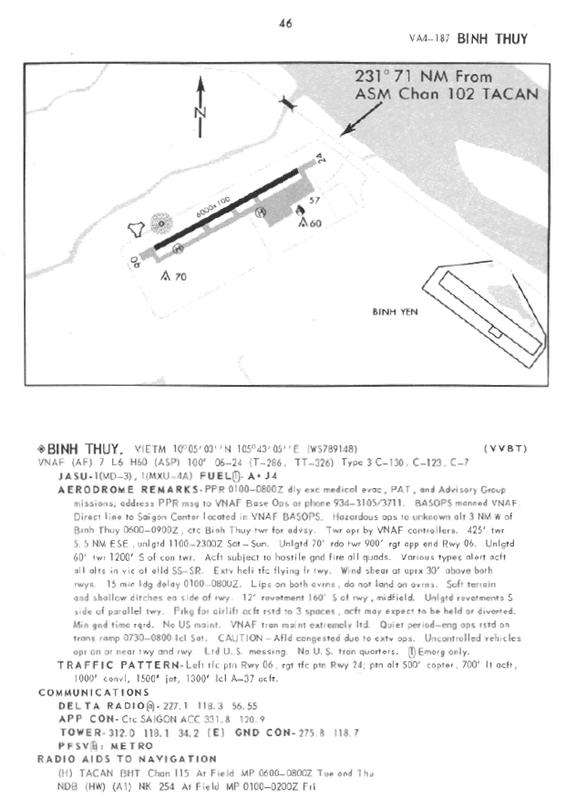 This increased the allowable gross weight (and the possibility of going off the far end of the runway if something went wrong). My nav comes on a little strong sometimes (his nickname is King Kong). He would make a good AC--he is sharp but occasionally I have to remind him that he's the navigator and I'm the AC. The frag order was incorrect when we were briefed for the bladder mission and the duty officer and I were straightening out our itinerary. Meanwhile KK noticed that ours was the only Katum mission that was not classified as combat essential. 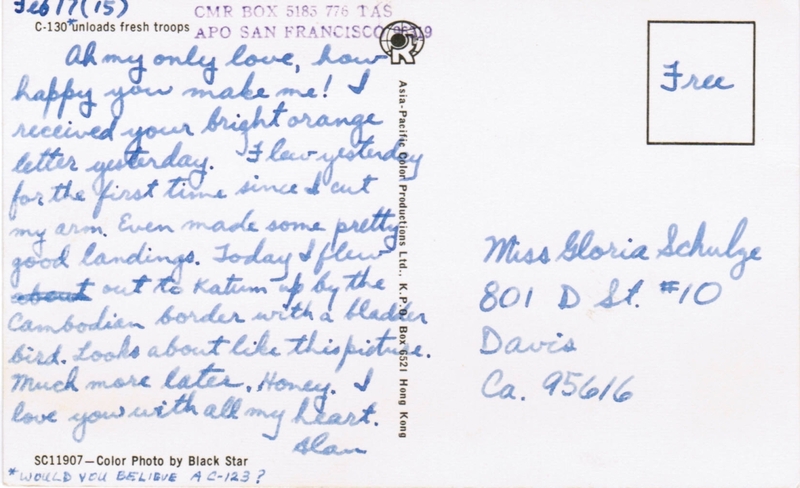 So he had the duty officer check with Hilda and get it changed to CE so we could carry in more fuel in our bladders. 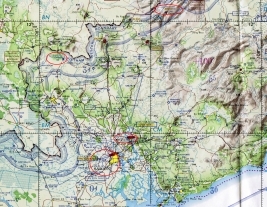 Yes, the sortie was intended to be combat essential, but the navigator cannot set the aircraft's landing weight and rollout for short fields. So KK and I had a little talk about who makes those decisions. I think we understand each other a little better now. 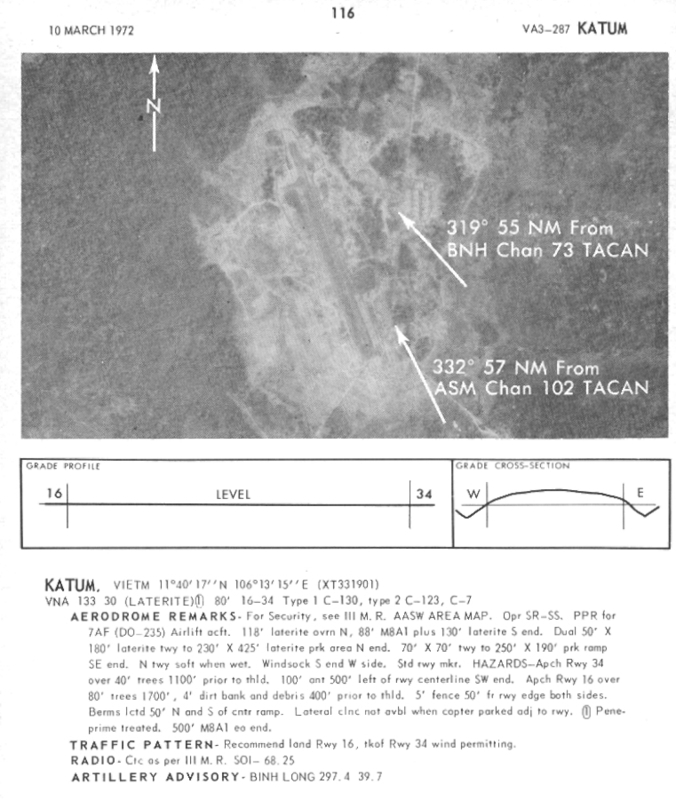 Our last sortie to Katum (in the fish hook area by the Cambodian border) turned out to be kind of interesting. On the first two sorties John Roohms was giving another pilot an initial SEA check. Stace rode along on both to log some time to put him closer to upgrading from copilot to AC. I rode out on the first shuttle just to scope out the situation. After sitting out the second one I flew the third mission. We dealt with friendly fire and hostile fire daily. As we approached the field on that third flight we monitored the radio frequency for "Tailpipe Alpha". Tailpipe is the call sign for the combat control team-- the first USAF guys into a remote airfield like Katum. They coordinate airlift operations at the field, act as control tower where there is no tower, and aerial port where there is no aerial port. Tailpipe Alpha reported that there were incoming rounds but no damage yet. 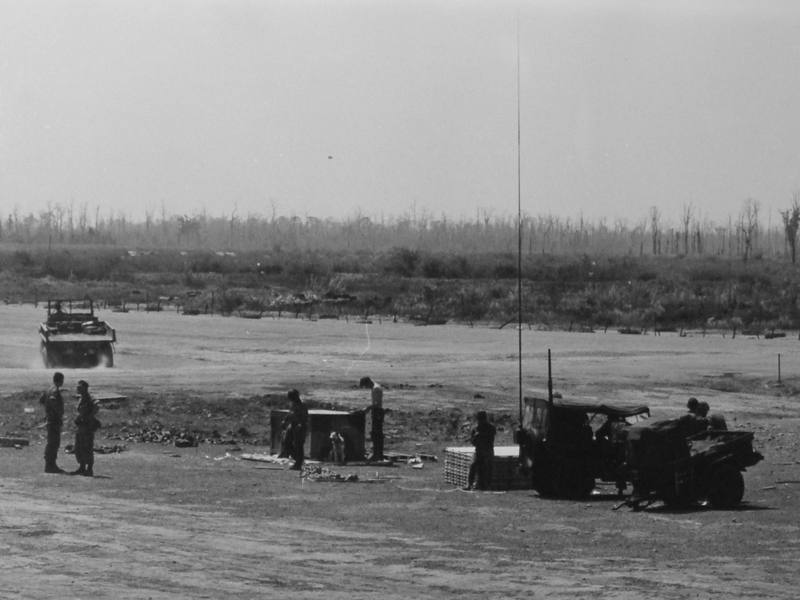 So we orbited nearby and talked with Alpha and Hilda (call sign for the airlift control center at Tan Son Nhut). They told us that it was all clear and the runway was OK. Meanwhile the good guys at several nearby fire support bases had cranked up their artillery and begun shooting back. One of these FSB's was located at the approach end of the runway. 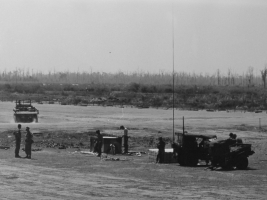 These artillery bases had no radio communication on VHF or UHF aviation frequencies; instead they had their own FM frequencies. C-130's had been retrofitted with an FM radio at the navigator's station so we could communicate with them and stay clear of their fire. This day as usual the navigator talked with them to ensure that they held their fire while we landed right over them. And as usual they said they would. I was concentrating on my short final approach when I saw puffs of white smoke coming up from the FSB! They were firing their Howitzers again and we were flying right into their fire! I immediately dodged to the right and broke off the approach. I climbed back up and orbited nearby while the nav chewed them out for not passing the word to the guys firing the guns. Once they had really halted their fire we landed uneventfully and firmly. We pumped out our fuel, flew on to Binh Thuy, then back to Tan Son Nhut. 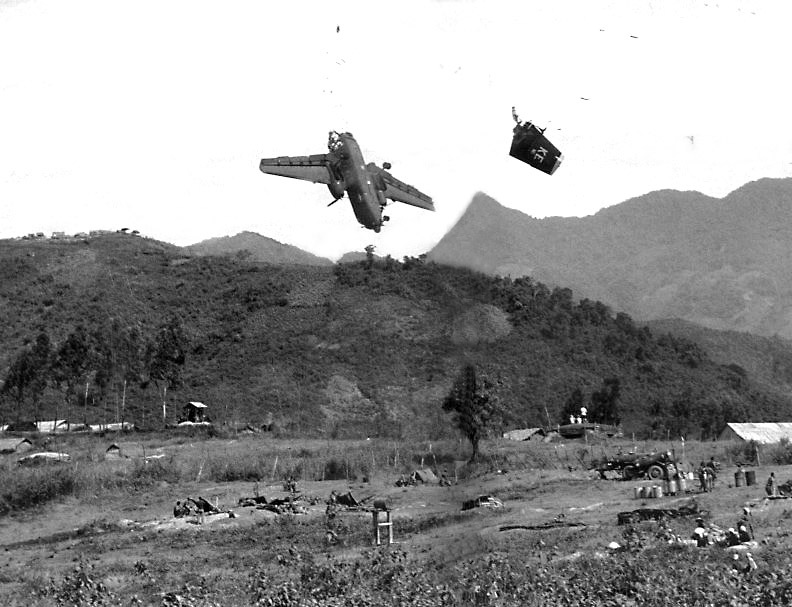 In a similar situation three years earlier, a Caribou was shot down by friendly artillery on short final to Duc Pho.